Thanks for visiting our website. We have a lot of past posts that give you a good sense of our farm, so take your time, read through a few and check out some of the videos. You’ll notice we haven’t posted anything in a while, but don’t let that discourage you. We’re still here! Check us out on Facebook for more recent updates or to leave us a comment. Or better yet, come visit us at one of the Farmers’ Markets! Change is constant. And one rule of resilience is abundance. So I want to begin this post clear in the fact that although we don’t yet know what this year or the following will bring, we do believe we’re moving forward, in the right direction… whatever that is and wherever that takes us. It has been difficult to process this loss. There’s no wake, no funeral, no sitting shiva. There’s no headstone. In fact there’s no body. Fuller Street sits there as it always has. As if nothing has changed. And because it’s January there is no way to understand that something so significant is gone. January is always like this. Occasionally we might swing by there to get something from the barn, or store something in the attic, but basically it sits idle until spring. What’s now gone is not Fuller Street. It’s the life and the community that would awaken early each spring filled with anticipation and would be followed by the excitement of families picking up their first share of the year. It would be rich with laughter – children running around the farm, playing on the tractors, feeding the goats, eating peas as fast as they could pick them. It would include exhausting and at the same time lazy afternoons chatting with CSA members as they sorted through the potatoes and onions selecting just the right ones, telling jokes, sharing recipes, complaining about the weather, and reveling over the food. It included cold rainy days hiding under the tent as some members crammed in to stay dry while they filled their baskets while still others marched off into the rain to pick their flowers and stock up on tomatoes and basil. It included farm days full of music, food, and friends. It lasted four years and became a rich and fulfilling experience for me. As I went back to school for my first fall weekend in September, before the farm season had fully ended, I felt a sense of loss knowing that this past year couldn’t be repeated. I would graduate in May and would have to find work in addition to the farm. I knew then that the freedom I’d had for the last two years was temporary… it was a gift. But at that time I assumed the world I’d come to love would continue. And that whatever I did, it would include finding days on the farm and afternoons with the CSA. I am grateful that this change took place now, and not a year ago and that I’ve been able to immerse myself in that life for the time that I did. I don’t doubt that through the farm and other, as of yet, unknown future activities I will continue to find rich and fulfilling experiences. I hope and trust that we find new land to rebuild both the soil and community that we’ve spent the last 4 years cultivating. But just as Plato brings us happiness while doing nothing to lessen the loss of Einstein, the new paths and unexpected joys that come next won’t change the loss I feel over the community we all shared on Fuller Street. 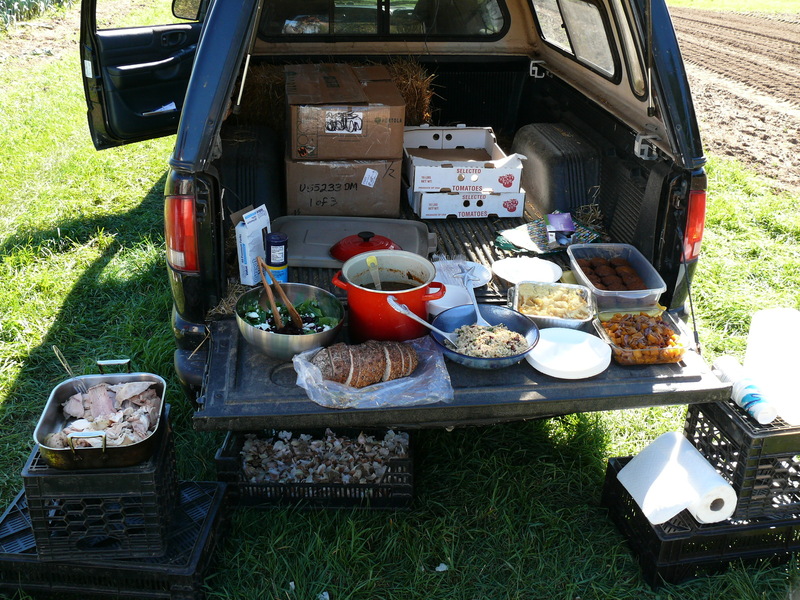 Saturday marked our last regular CSA for the 2010 season – we’ll still have our one-day Thanksgiving share. Sadly, I missed the last day as I was off at school this weekend, but I was there Wednesday to say goodbye to our friends and members. Many people asked if it was bittersweet. The answer was immediate… nope. We love the farm season – the CSA, the markets, sunny days in the fields, hands in the dirt, the excitement of the first pea, tomato, garlic, watermelon. We love the potlucks and field days. We love picking tomatoes – for a while. Digging potatoes – when it’s not raining and cold. Tossing watermelons off the field – for the first 1/2 hour. And it has been a truly incredible season. The weather couldn’t have been better. It’s true it was dry, but luckily we had invested in irrigation last year and finally got to use it. We had some of the best harvests yet. Some of the tastiest produce and fruit. Those of you who tried our melon know what I’m talking about. Our market stall would fill up with people when we laid out 100, 200, 350 pounds of tomatoes. Our CSA members would lug home tens of pounds of produce, filling up baskets and bags and boxes. One day we harvested over one ton of tomatoes. Another day we pulled over 3,000 pounds of squash off the fields. We harvested 9,000 heads of garlic. 14 rows of potatoes. And the fields are fuller than they’ve ever been at this time of year. They are rich with carrots, turnips, braising greens, lettuce, spinach, and leeks. Our root cellar is loaded with potatoes, squash, and more. All of which will make their appearance through the winter markets at Plymouth. It’s been a great year. We’ve seen children in our CSA learn to walk. Babies have been born. New friends have been made. We’ve discovered new recipes and shared many dishes. Our annual farm-day potluck saw over 100 visitors. Field-days have been full with volunteers. It really has been a great year. Farming, like nothing else I’ve experienced, grounds you in the here and now. Its a good place to be. And we appreciated the summer months while they lasted. But they’ve come to an end and we’re on to what’s next. We’re eager to slow down, sleep in, cook and eat. We have tractors to fix. Siding to put up. House work to do. Holidays to prepare for and celebrate. And there is still food to harvest, field work to be done, and markets to attend. Thanks to all of you who shared in this wonderful season. Thanks for bringing your families to our farm, making your children a part of our lives, visiting us weekly at the market whether 95 degrees or cold and raining. We appreciate the potluck dishes and recipes you shared, the thanks you offered us, and the occasional treats – pumpkin bread, wine, delicious and warm soup. 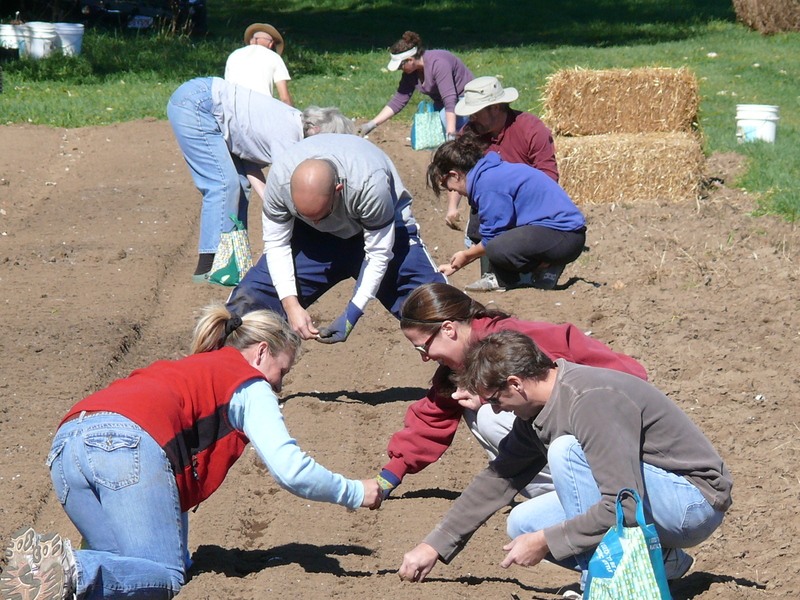 Our farm is as much about the community we build as the food we grow. Edible South Shore is celebrating the heroes of our local food community. Farms, farmers, chefs, food artisans, and more. Voting ends December 3rd and winners will be listed in their spring edition. 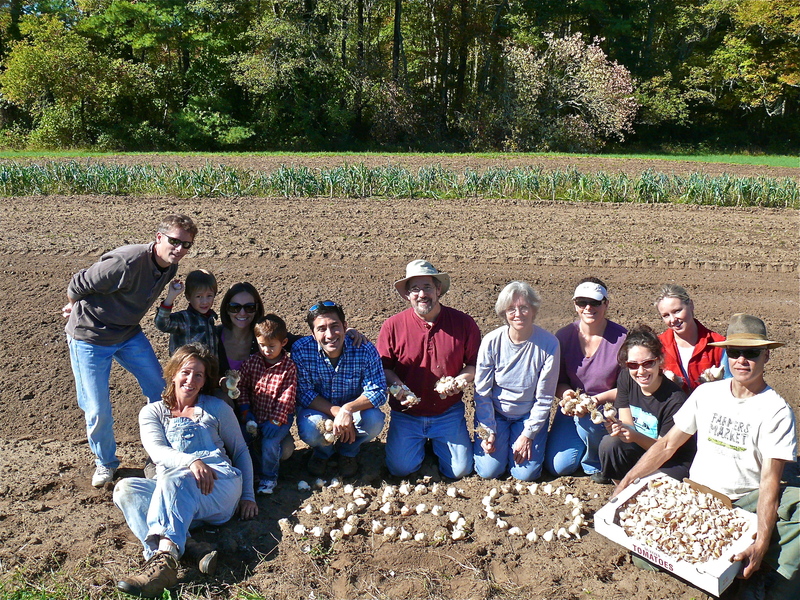 Yesterday we had our third-annual garlic planting party. As it fell on 10/10/10, we registered it as a 350.org event – a global work party to bring attention to climate change. 15 of us gathered at Soule Fields to spend a truly beautiful fall day out in the fields planting garlic, digging potatoes, eating, talking, and laughing. These volunteer days are so much more than just work. A group of strangers come together and get to know one another while enjoying great weather, incredible food, and while accomplishing something tangible. Although it took us about 2 hours to break all the garlic heads down into individual cloves, the task was broken up with conversation, laughter, and entertainment. Planting our first bed of over 2,000 cloves, took only 15 or so minutes with 30 hands at the task. As well as rides on the water-wheel transplanter and one long awaited chance to finally drive the tractor, people got to enjoy an absolutely amazing potluck lunch. Farming is all about food, and the real reward is when people have the chance to take the raw ingredients that we’re growing and turn them into incredible dishes to share with others. We cooked up one of our hams and chickens on the grill and I made a lentil soup full of farm-fresh veggies with a side of fresh bread-share bread. Michelle stunned us all with her quinoa salad. Lynn turned simple beets and arugula into a fantastic salad. Cherie, with some Indian spices added incredible flavor to roasted squash. Julie, knowing the real value of butter, created an unbelievable pirogi casserole. And Rachel contributed mouth-watering pumpkin muffins. It was a great day and in it we accomplished what would have taken our small crew a week or more to complete. New friends were made and recipes shared (all of which I will post) and people went home feeling good. Thank you all for you hard work, tasty dishes, and great company! Without it, there would be no food. And it’s fascinating to think, when it’s raining, where the water that’s landing on our fields has been. It may have flowed through the Amazon. Or been in a cooking pot in India. It may have filled a pool in Beverly Hills. And after it nourishes our plants, soaks into the soil, finds its way back into our well, is pumped up to our hose, evaporates again, who knows where it will go. But rain brings challenges. First of all, it’s wet. And can be quite cold. It can soak into your clothes and remain there through a day in the fields or standing in the wind at the farmers’ market. But this challenge can be overcome. Carhartt. After the 4 days of cold and wet back in August, Dave and I invested in some Carhartt rain gear: sturdy bib overalls and a rain coat. Coupled with our knee high muck boots, we’re impervious. The getup is a bit bulky and would be quite hot in mid-summer, but over the last few days its been worth it. But there’s another challenge that we can’t overcome alone. And that’s the market. Rainy days are slow days. People aren’t as excited to come wander through the stalls at market and pick up their weekly supply of local food. Whereas we don’t really have a choice, and get up early to harvest, wash, and pack regardless of weather, those purchasing the food do. Now I understand wanting to stay dry. I want to! And it’s not always fun sloshing through puddles to pick out your eggplant, beets, lettuce, or whatever else looks good. 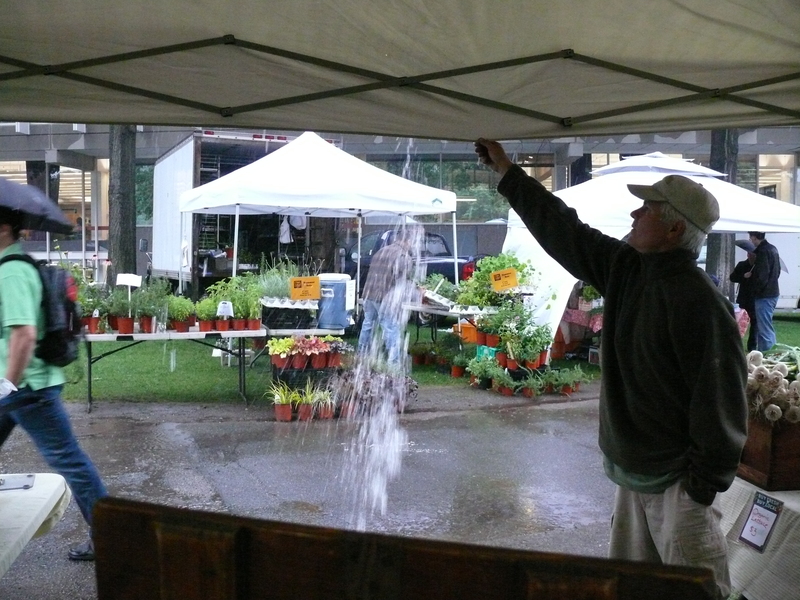 But I encourage everyone to make it a point of going to market on those rainy days. Visit with your farmer. Support their hard and wet work. Satisfy your appetite. Pick up some greens, potatoes, onions, turnip, carrots, garlic and more to go home and make a warm hearty soup. Thank you to all of you who do come out. You make the work worth it! And who knows, perhaps the rain that falls on you through the market once filled the glass of a president, or a peasant, or a long past ancestor.